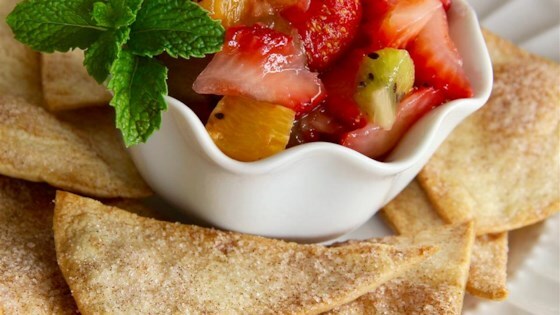 "This is a perfect alternative to plain fruit or sugary snacks! Can be served with multi-grain or cinnamon-sugar tortilla chips." Stir lemon juice and sugar together in a bowl to dissolve the sugar; add strawberries, pineapple, kiwis, and orange pieces and stir to coat in the lemon juice mixture. Cover bowl with plastic wrap and refrigerate at least 30 minutes.